With Amazon on board, delivery robots are now a big deal. To absolutely nobody’s surprise, Amazon announced today that it will roll out its own network of delivery robots. Amazon’s diminutive new six-wheeled friend is called Scout. It’ll deliver your packages, according to the company, without a need for a pesky and demanding human. Scout is about the size of a small cooler, and rolls along at walking speeds. Amazon says it’ll be able to navigate safely around “pets, pedestrians and anything else in their path,” according to a press release. An initial trial will be limited to Snohomish County, a region north of Amazon’s home city of Seattle, Washington. Amazon will start off with just six Scout devices, delivering only during daylight hours during the week — likely to avoid heavier foot traffic on sidewalks. Amazon isn’t the first company to jump on the delivery robot bandwagon. We’ve seen numerous companies announce their own fleet of autonomous delivery vehicles. But considering the scale of Amazon’s operations and its sheer number of customers, this is a big deal. Amazon has more than enough influence over the online shopping world. 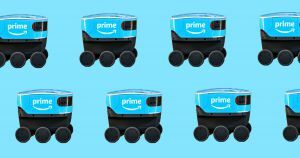 Now that the world’s most valuable company has expressed interest in the technology, we could see a lot more robots like Amazon’s Scout navigating sidewalks in the near future.